There are many ways to go in this race. The most intriguing contender is Squeeze (#4), who returns from a lengthy layoff for Christophe Clement, who has decent numbers with this move. This filly was extremely impressive in her two starts last year, winning with much greater ease than the final margins would suggest. However, she’s facing the toughest field of her career off the break, and you never know how these precocious runners will return as older horses. Clement’s other runner, Gioia Stella (#6), is a major contender and probably the horse to beat. She never had a chance on dirt last time, but her form toward the end of 2016 was strong, and her tactical speed should have her placed close to what figures to be a moderate pace. I’ll certainly use those two, but the runner who intrigues me most from a value perspective is POP BY (#5). Graham Motion typically does very well with his European imports, and Pop By has a right to take a major step forward in this country. 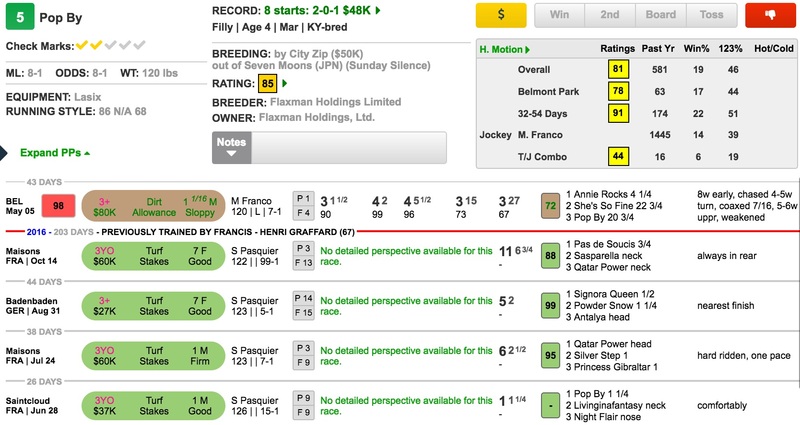 You can ignore her U.S. debut, in which she didn’t handle dirt in the same race that Gioia Stella exits. She showed in France that she runs her best races over firm turf, and she figures to get that kind of going on Saturday. She has the pedigree to be a nice horse given that her dam is a full-sister to the dam of Breeders’ Cup Mile winner Karakontie. This is a bit of an educated guess in a confusing race, but she figures to be an enticing price. Afraid it will go off the turf. I won’t play it.